Since 2005 Paradise 8 have been offering world-class gaming to players throughout the world. We are one of the original four casinos to launch online with the coveted Rival Powered software and our longevity in the industry is a testament to our entertainment value. It is our aim to make every visit to Paradise 8 an exciting one! For this reason we offer some of the most innovative and exciting online casino games available on the web. With nearly 200 games including Slots, Table and Video Poker games, numerous "Specialty" Games and the coveted i-Slots™ available only with Rival software, we've got something for everyone! The casino is set against the backdrop of a lush paradise, a tropical beachfront resort where any fantasy can come true, and often does! 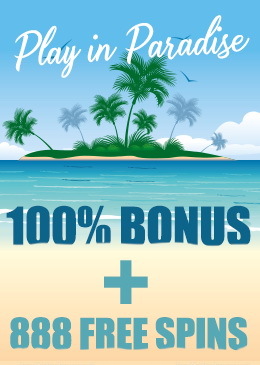 Paradise 8 also has some great bonuses waiting for you to claim! Get up to a $1776 Free with the Slot Lovers first deposit match bonus. Play our revolutionary slot games with daily Reload bonuses and THE BIGGEST match bonuses found anywhere on the internet! We even offer a $88 Free no deposit bonus for any newcomers who want to try their luck at the casino! At Paradise 8 we pride ourselves in having some of the best customer service in the industry. During your time with us, if you are ever not completely satisfied with the service we provide or if you have an issue that you feel has not been adequately resolved by our support team please feel free to email me, the casino manager directly at manager@paradise8.com.